Irving Penn’s retrospective exhibition at the Metropolitan Museum of Art traces his career in fashion and portrait photography from 1943 to 2008. Centennial, a retrospective exhibition of photographer Irving Penn’s long career, installed at the Metropolitan Museum of Art, flows chronologically through extended assignments Penn was given by Vogue magazine and other sponsors between 1943 and 2008. The subject matter is neatly organized with each project type to its own room, and every grouping punctuated by iconic images visitors are likely to recognize. Particularly revealing are notable differences between the classically modern Vogue covers and fashion work and Penn’s portraits, particularly the early ones from 1948 that reflect a sensitivity to spatial arrangement that he retained for much of his career. For these portraits, Penn preferred a studio environment to actual locations. In more remote locations he actually constructed flimsy tents, which seems odd considering he had travelled to remote sites only to bring his subjects indoors. There, he created an environment that allowed the subject collaborate, without letting them take over completely, giving a sense of shared control between artist and sitter. His initial insistence on the studio environment was tactical, as it provided leverage in the inevitable negotiation between a mere magazine employee and his celebrity subjects. At age 30, his first major assignment for Vogue was to produce portraits of individuals with sizable reputations, including Marcel Duchamp, Igor Stravinsky, Salvador Dalí, and a precocious Truman Capote. In the face of such egos, he had to keep them slightly off-balance. To do so, Penn augmented his no-frills studio with a plain, three-sided booth of gray walls that converged into a narrow corner. Placing his subjects into this unwelcoming maw likely left them gently contained and slightly confused, with the result that the camera became witness to a joint creative effort between subject and artist induced by the awkwardness of the situation. The result was like the improvisational art of the time — bebop, Abstract Expressionism, Kerouac’s run-on narratives — with portraits that were about their making. A quick review of the first series of portraits, executed between 1947 and 1948, finds artist Marcel Duchamp adjusting to his confinement with unperturbed elegance. Pipe in mouth, hand in pocket, his wintry stare completes an unshakable composure. Actor Spencer Tracy smiles winningly while his body confesses a resentful acquiescence. Choreographer Jerome Robbins, in rehearsal clothing, does his best to move as if the narrow space had no hold on him. Writer Truman Capote squats like a school boy in a bank chair, head tilted to the right, cigarette dangling to the left, lost in an overcoat that ironically exposes his diminutive stature. But he holds his ground, answering the camera’s aggression with a look of carefully practiced boredom. Through this technique, Penn gets each picture to reveal something of the subject’s personality. Nearing the end of 1948, and following the completion of a fashion project in Lima, Peru, Penn’s crew, model, and editor, along with a trunk of designer clothing, returned to New York while artist and camera headed into the mountains in search of the indigenous people of Cuzco, a place he had read about via Pablo Neruda. Following a long-established tradition of ethnographic photography, but abandoning that tradition’s scientific passivity and applying instead his unique approach to portraiture, Penn purposefully engaged with each subject. Renting a local photographer’s studio, he took thousands of exposures during a three-day session. Extraordinary pictures emerged, ones that were closer in style to his penetrating celebrity portraits. Situating these subjects in yet another raw studio space, he balanced each subject’s poise with his own technical concerns for lighting, folds in clothing, and subtle manipulations. These sessions produced “Cuzco Children” (1948), in every respect a masterpiece. Centrally installed in the exhibition room and given full-page treatment in the 370-page catalog, this is not just one of my favorite photographs, but one of my favorite depictions of human beings in any medium and from any period. 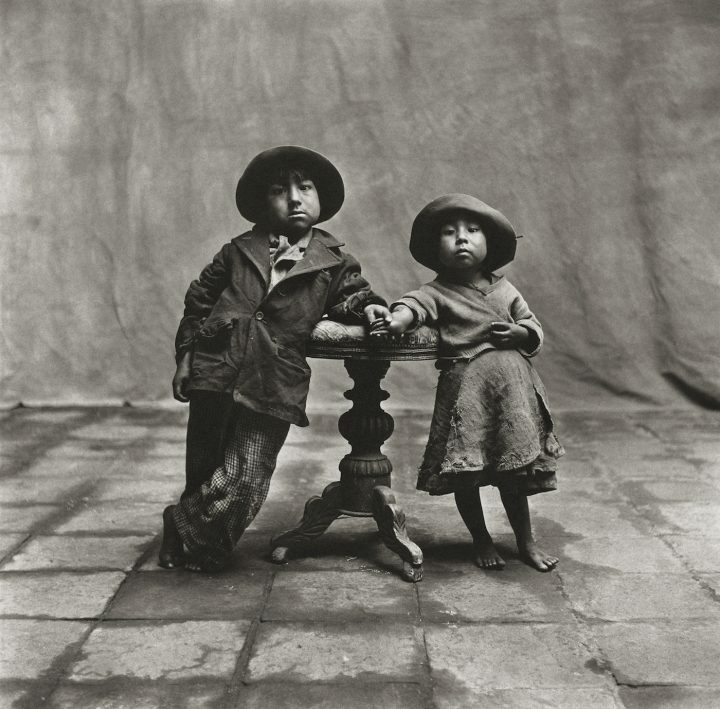 A boy and a girl about 5 to 8 years old, most likely siblings, each standing far enough from a small, round table to necessitate leaning toward it, rest one arm each on its surface while they both look directly into the lens. Chins raised to the light, their surprising self-regard seems irreconcilable with their youth. Perhaps the dignity they exude is a function of their clothing, a miniature version of adult garb. The girl, apparently the more self-assured of the two, belies the innocence of her chubby, angelic face with a modest clasp of her shawl. The boy acts more his age; the dutiful handhold he offers his sister reads as Penn’s idea. Yet as a collaboration between artist and sitter, they more than meet their obligation. 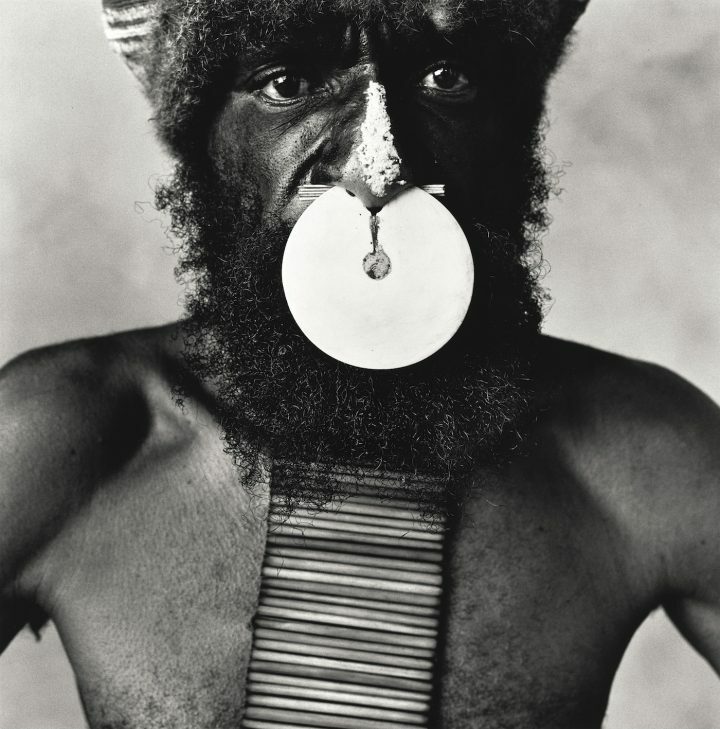 Anomalous to this trend are several projects dating from 1967–1971 that focus on tribal culture in New Guinea, Dahomey (now Benin), and Morocco, as these images seem to break with Penn’s characteristic interplay between subject and artist, relying instead on a more standard ethnographic approach. Between their questionable use in a fashion magazine and the artsy black-and-white printing that nullifies how color is used in indigenous garb, these images look passive and self-consciously exotic. According to anthropologist Harold E.L. Prins’s catalog essay, Penn’s images appear to conform to an unfortunate late 1960s bias that mystified and romanticized tribal culture, ironically in an effort to counter typically patronizing colonial attitudes. Penn’s apparent effort to embrace a problematic subject outside his usual approach resulted in images that fell far short of his usual standards. Centennial encompasses much more than Penn’s portraits — there are rooms solely dedicated to nudes and a great deal of innovative still life work. But in assessing Penn’s overall achievement, I found his portrait work to be the most impressive aspect of his legacy, from his studies of bakers and butchers to major Hollywood personalities. And, as if to emphasize the point, on your way out, his old canvas backdrop hangs in the last room, available for your own personal iPhone tributes. Irving Penn: Centennial continues at the Metropolitan Museum of Art (1000 5th Ave, Upper East Side, Manhattan) through July 30.